As we pop open more and more doors on our advent calendars, the days to do some Christmas shopping are dwindling as quickly as the mulled wine is being consumed at the office party. Some people love the last minute dash, running around the shops on Christmas Eve, as disgruntled retail workers politely smile on the outside but scream at you on the inside. It’s a magical time of year. Others have their shopping done and dusted well in advance, they beat the queues, maybe even ordered it all online, and are now smugly sitting back with a glass of eggnog in front of the fire. Whichever type of shopper you are, though, when you see a present that’s just right for someone, you know you’ve got to get it. Forget the budget, forget the equal allocation of gifts between family members, you just can’t argue with the perfect gift. So what is the perfect gift, I hear you ask. Well I’ll tell you – it’s a fart in a jar, of course. A fart in a jar? Can you explain please? Yes, yes I can: it’s a glass jar, with a lid on, and inside the jar is a fart. What’s the point of that? Well thanks for asking, but that’s not for me to say. Instead I’ll let Farts Direct, the folk behind the precious present, explain. Farting is a part of what beautiful mother nature created right? And we should be loud and proud about it! So, if you fancy, you can choose from aromas such as ‘Sprout Stench’, ‘Stuffing Shart’, or ‘Curry Napalm’, even pop a little personalised message inside the jar, and send it off to a lucky recipient. We need to let the stigma surrounding farts go, by letting one go. It’s important to share the guff – especially at Christmas time. I’m not sure how you express yourself at Christmas, but this is one way of doing it I suppose. Send them to your friends, lovers, enemies, colleagues, it’s up to you. Now imagine the look on their face when they realise they just inhaled an invisible turd. And once they’ve breathed in the surprise stench, you’re done. It’s the perfect way to tell someone how you truly feel without ever having to say a word. 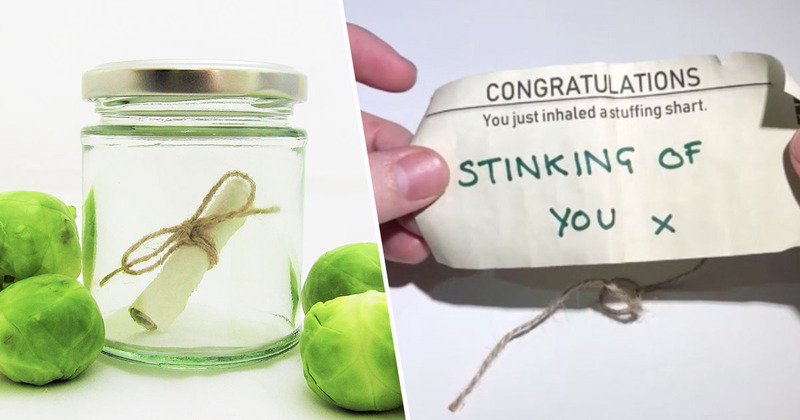 You can also personalise the smelly gift by adding a message inside the jar, and if you make it really good it’ll mean the recipient has to open the jar. So there’s that.